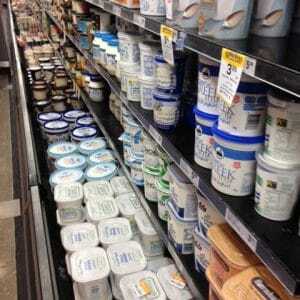 What is the Healthiest Choice of Yogurt? Oh boy, here goes! 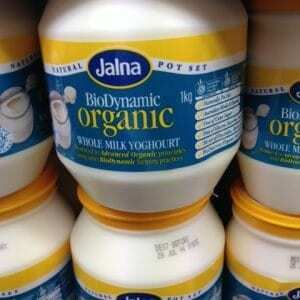 Yogurt is confusing – you can even spell it 2 ways!! Yoghurt & yogurt are apparently both ok.
As a health conscious food shopper, yogurt selection can be a daunting & time-consuming process! The many brands, flavours, ingredients, low-fat, no-fat, full-fat, Greek, strained, sweetened, unsweetened, kefir, organic, biodynamic, coconut, soy, vegan, goat, sheep (I think camel is coming soon), pro & pre-biotics of various types, manufacturing processes, packaging…and of course the ‘should we even eat dairy’ question!! The yogurt section is huge these days! It’s a tricky one – probably easiest to start with the list of definite ‘no’s’! 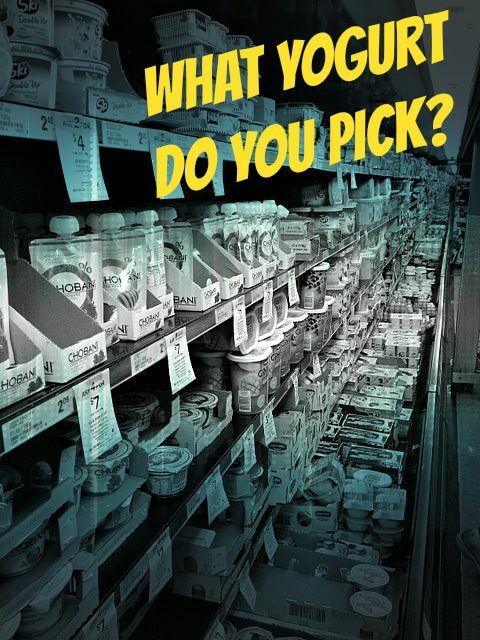 There are some really unhealthy options in the supermarket (unfortunately usually the ones your kids will ask for!). Yogurt can be very high in sugar (some are more like a soft ice-cream). You’ll need to check the nutritional panel – look for anything under 7g carbs as a guide if weight loss is a goal. Don’t even touch the ‘sugar-free’ flavoured yogurts – they’re all full of artificial sweeteners – and other indigestible chemicals which are often worse for us than regular sugar. I have not seen any good sugar-free flavoured dairy yogurts. Milk (& therefore yogurt) naturally contains lactose (a type of sugar), so if there’s no sugar content it ain’t gonna be natural yogurt. Those are out! On the subject of lactose (which is just two simple sugars – glucose bound with galactose), many of us find it difficult or impossible to digest, due to the cessation of production of ‘lactase’ (the enzyme we secrete as babies to breakdown lactose into the easily digestible glucose and galactose parts). In most good quality natural yogurts, there are billions of friendly bacteria who love to eat lactose, so they pre-digest much of the lactose for us, meaning that a lot of people who can’t drink milk due to the lactose content, can handle yogurt thanks to these little guys. Some dairy intolerant people are actually reacting not to the lactose though, but the casein (a milk protein). Dairy yogurt is definitely unsuitable for these people. Strained natural / plain Greek yogurt (not sweetened or flavoured Greek yogurt) has the lowest carbohydrate (& hence sugar & lactose) content, as during production some of it is strained off along with the whey. This also means that the remaining protein in strained Greek yogurt is almost purely casein (the slow release, non-whey protein in milk, which keeps you full longer but is more difficult to digest, and is the portion of dairy that most dairy allergy-sufferers react to). Strained Greek yogurt has almost double the protein content of regular yogurts, as well as approx half the carbs, so really appeals to those following low-carb / high protein diets. However, the whey is one of the most nutritionally beneficial parts of yogurt, and to strain it off for the sake of texture and lessening the carbs does not seem sensible to me, especially when you consider the environmental impact this method of production can have, using 3x the milk to make the product and creating a byproduct which needs to be trucked, dumped and disposed of (google acid whey). Don’t confuse ‘Greek-style’ with the strained Greek yogurt, it may be thicker in texture but will still contain the same protein:carb ratio as regular yogurts. 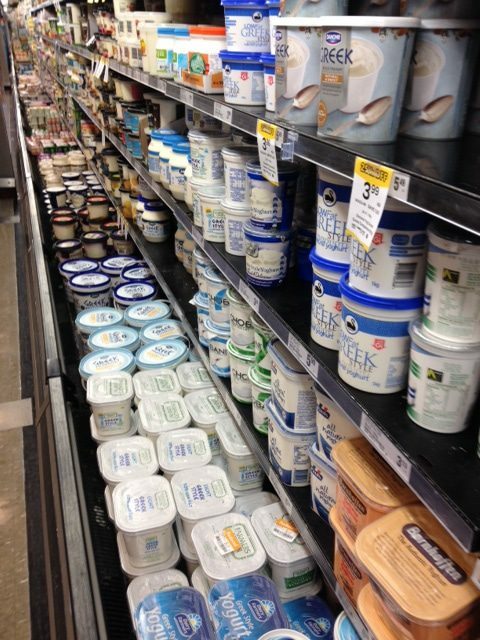 Greek yogurt will also be lower in calcium than regular….just to confuse you further! Interestingly, Greek yogurt was originally made from sheep’s milk – only more recently from cow’s milk. Sheep and goat milk yogurts are available in some areas, and may be a better option for folks who can’t handle cow’s yogurt. Another option for the dairy dodgers may be A2 milk yogurt, which has less potential for reactivity. Coconut yogurt has made quite a splash with healthy consumers, as it’s completely dairy (and therefore lactose & casein) free, made from coconut milk or cream with added cultures and a few things to help sweeten and thicken (like stevia, pectin and tapioca starch – generally nothing too scary but coconut yoghurt quality can vary immensely). Watch out also for imitations which are still dairy based, just adding some coconut in to jump on the bandwagon! In a coconut-based yogurt, sugar & protein are low, and fat is high (good fat though – MCT’s which help with metabolism and fat burning). 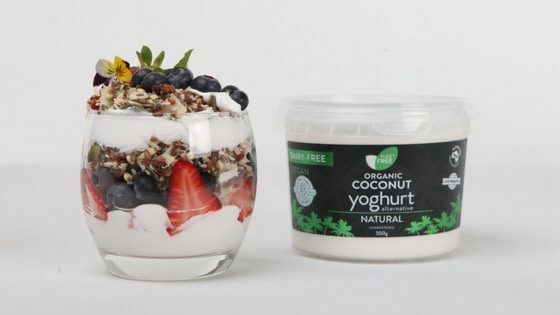 Look in your local health shop or ask us at the markets for Pure & Free (natural) – our fave coconut yoghurt as it’s super-creamy & tasty, certified organic, has a really clean ingredients list, plenty of probiotics & is completely unsweetened. It is also much lighter than some other coconut yoghurts as it’s made from the milk not the cream. Soy yogurts, on the other hand all seem to have a long list of questionable ingredients, and soy itself is a questionable / controversial food! I would avoid these. The question of dairy is an individual one – a lot of folks just don’t thrive on it, feel & function better when they’re off it. They may be unable to digest the lactose, or reacting to the casein or both. If this seems to be you (find out by going completely dairy free for a few weeks, then re-introducing one product at a time, starting with butter, then natural yogurt, cream, cheese, ice-cream etc). Keep a journal of any symptoms / changes as you reintroduce things. Most people tolerate butter well, yogurt and kefir are the next less reactive options (less issues with the pre-digested lactose) and milk and ice cream have the most potential for reactivity. Some people find raw or ‘bath’ milk (unpasteurised, unhomogenised, straight from the cow) fine but will react to processed milk products. If you tolerate dairy fine, then there’s the question of environment and ethics – the cow’s don’t just walk up and offer their milk as a gift, and depending on the producers there are some horrendous practices which ‘help keep the cost of production down’. Male dairy calves are not useful in the industry so generally do not get past a week old. I would imagine it is very difficult / impossible to run a viable dairy operation without some degree of animal cruelty, and a typical commercial dairy farm leaves a substantial environmental footprint. Find a farmer’s market nearby or a local organic farmer who’s willing to sell some of his yield – usually the smaller the operation, the better treated the animals and the land, and always choose organic if the option is there (ensures your yogurt and the cows it comes from are free from added hormones, antibiotics, fertilisers, herbicides, pesticides, etc and have been eating mostly grass). Whilst market shopping you’ll also discover heaps more interesting fruit and veggies, and generally a much higher standard of produce than the supermarket. Loads of seasonal bargains too – shopping at markets can work out much cheaper if you get to know the right places / times to go! If you’re not a fan of natural unsweetened yogurt – try mixing a sweeter yogurt in until you get used to it (you can adjust the quantities gradually). 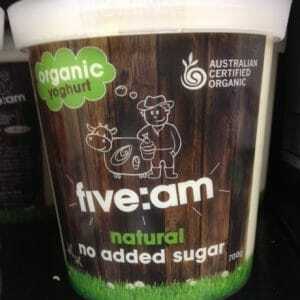 This is great to wean kids gradually from sugary sweetened yoghurts. If you are looking for a more ethical dairy option – ‘Barambah’ (available in health stores & independent grocery stores only) is a leader & also Mungalli Creek & Paris Farms. These are some of the best Aussie choices (animal welfare & sustainable farming are much more of a priority for these guys, plus their yoghurts are nice & natural). Check out this table which also rates a lot of yoghurt brands on their ethics: & also has much more info on shopping more ethically.